We believe in sensitizing our students to the world outside and as a part of it, we undertake numerous activities. Some of them are the reports by students and teachers. The students of Class VII were taken to the Goraj Muni Seva Ashram on 24th July,2014.This endeavour was initially planned as a curricular venture as the students had a lesson on old age and hospital in their English Text Books. But it later on served as a great motivator to sensitize the students of several social issues. The Muni Seva Ashram was built by the Bombay Public Trust and is presently working in sectors like health care, education, training programs. Students got an opportunity to visit the Akshar Purushottam Arogya Mandir, a part of the Ashram which provides general medical care and is a state of art building. They visited the wing of cancer Hospital which is situated in the campus. The students were amazed to see that a 100 ton of the AC plant was run with the help of green energy the bio gas. As the time was insufficient the students could not visit the old age homes and homes for the differently abled children. In the end the students have taken loads of good memory and plan to visit the Ashram again. This was the most memorable moment in the lives when Students of Class VI visited VCare, an NGO working for animal care. The founder of the organisation is Ms. Nandita Amin, incidentally President of The Gujarat New Era Education Trust. Vcare is a not-for-profit organization with the single aim of providing effective means for the prevention of cruelty to animals. Since 1997, the Vadodara Center for Animal Rescue and Emergency (VCARE) has tried to alleviate pain, fear and suffering in all animals. It was founded by a group of caring citizens who were pained by the inhumane treatment suffered by many animals in our society. They met Ms. Pratibha who is the director of this organization. She briefed students about the on-going programs in humane education, public awareness, an out-patient treatment facility including ambulance services, adoption services and special vaccination and other camps for canines and bovines. She also told that they had Boarding Kennels, a Donkey Shelter funded by the International Donkey Protection Trust, UK, a Bird Shelter funded by the United Way of Baroda in Lakdikui on the out skirts of Vadodara. After a brief meeting with her, students set out to explore by themselves. They saw many injured donkeys, dogs that were brought by people to be treated. It was amazing to see a cat being treated with Hydrotherapy and she was immersed in Medicinal Water to cure her from Paralysis. They also visited the donkey shelter and a big Rabbit home. The students of Class VI have collected a whooping INR 10,000 to be donated to V Care. The institution will in turn utilize the money contributed for treatment of various animals. 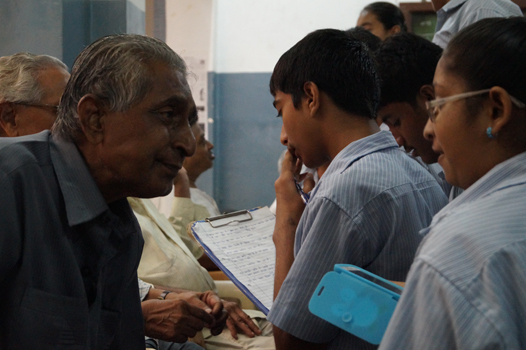 Vists to old age home and the visits of senior citizans to our school are very common. On 21st August the students of New Era Senior Secondary School visited an old age home-By Jalaram Trust as a project from CBSE. This was the project which was conducted under supervision of Mrs. Partima Paul and Mrs. Mithilesh Kashyap. 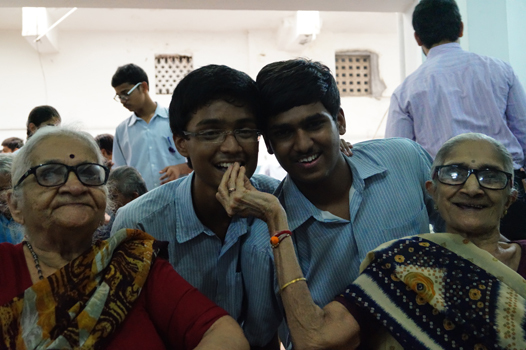 The students started from school and reached the Old Age home at 8:00 a.m. The seniors were very happy to receive the students for they know that the time the students spend with them is going to be full of excitement. The students started with a prayer. This was followed by conversations with them. While doing conversations with them the students asked them about their living conditions there and the kinds of facilities' that are provided to them. They played several games like housie, passing the parcel, antakshari with the seniors. Prizes were awarded to the winners. The students treated the seniors with ice cream. They were very happy and excited during the time the students stayed there. They felt that it was the happiest moment for them. The students promised that they would never send their parents or any other elder to old age home no matter what ever the limitations they may have. 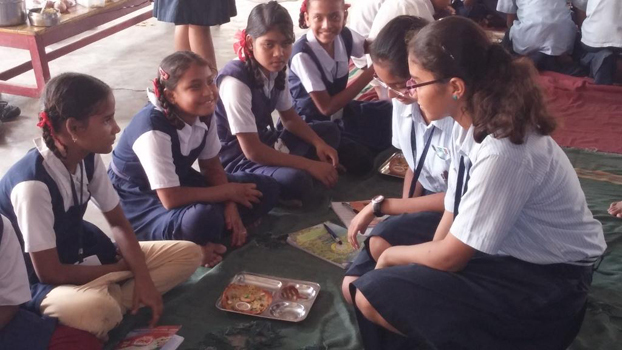 The zealous club, the interacts of New Era school, were teachers of Science and taught cell theory and the human skeletal system to the municipal school students of Deen Dayal School. The students of class 7 & 8 were taught to make a plant and animal cell. And Wow, the cells could be eaten after the learning. The base of the cell was made of roti , the nucleus was made from biscuits, the endoplasmic reticulum was of noodles to name a few. What a unique way of making a cell! The students enjoyed making it, eating it later and learned a lot. The students of class V were taught to make a paper skeleton and thus teaching them all the parts of a human skeletal system. The club is going to reproduce this in many other municipal schools in future. The Interacts started their first project of making greetings on postcards and also designing a booklet on rotary club. They have also attended two Atmanirbhar camps in which they learn to be self sufficient and independent. . The Earlyacts as their name suggests started their projects much earlier to their seniors. They are very enterprising and have constructed a small kitchen garden in school. They have planted coriander, methi, chillies, Lady's Finger, Bitter Gourd etc and are taking good care of the garden.